It was almost a year ago that I wrote an article on 2017 Social Media trends but it feels like it was just yesterday. Doesn’t time fly? Although time flies, so much does change and evolve online, and as I have grown as a digital transformation expert throughout 2017, I have learnt a lot. I want to share with you 8 amazing facts that I have learnt about marketing, and the importance of what they mean as we move closer to 2018! Throughout the year, I have been doing a lot of research, and analysis to find out what works best for my audience when it comes to writing content. BuzzSumo conducted a study throughout this year, looking closely at over 100 million headlines. 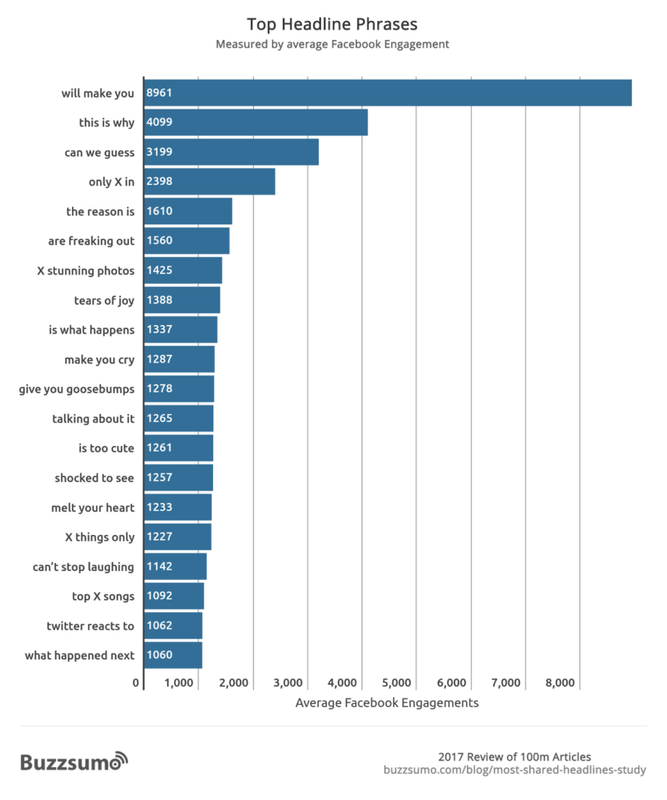 They found that certain words/phrases performed much better than others on Facebook. Below is a visual of what they discovered. The top performing phrase was “will make you”. This shows that promise words/phrases are going to be important moving forward into 2018. Making sure that the headlines for your content are worded in a way that shows direct impact to the reader is going to be key. They also found that, based on LinkedIn Shares, the top performing phrase in a headline was “how to”. 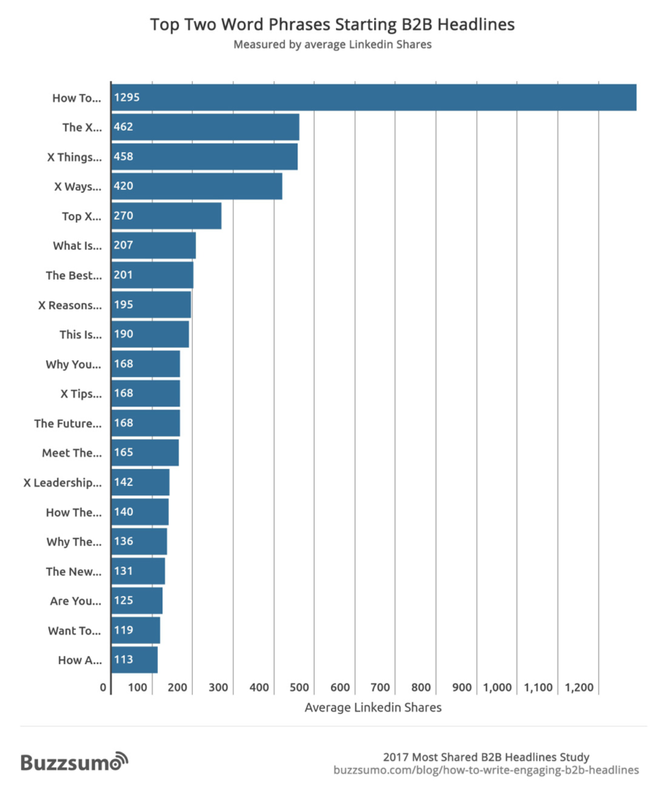 This didn’t surprise me as LinkedIn is a business network, so understanding how to do something better was going to be an important share factor. Did you know that video has the highest level of content engagement inside of Facebook? We all know how difficult it has been to reach our audience on Facebook this year, as their algorithm has changed dramatically. Studies show that an video post reaches, on average, 12.05% of a pages audience. Whilst this doesn’t seem like much, it’s still better than photos (11.63%), links (7.81%) and status updates (4.56%). On a similar note, there are many forms of video content, and live streaming is still a key part in running a successful marketing campaign. I found that over 65% of my audience said they preferred to receive information through live streaming and videos. Artificial Intelligence has been an interesting topic throughout 2017 and now that businesses are using pieces of machine technology to engage with potential customers, I know that 2018 is going to be an interesting year for AI and communication. I wrote a blog earlier this year on AI and a piece of technology designing my logo. Whilst the logo was somewhat generic, the ideology of AI is something that once developed, can be extremely powerful. According to a report by Economist Intelligence, 75% of businesses executives in the study said that AI will be implemented in their companies over the next three years and 79% believe that Artificial Intelligence will make their job easier, and more efficient. And if you are still unsure, it has been reported that 85% of customer interactions will be managed without a human by 2020. When you post a tweet, it’s lifespan is around 18 minutes. This means that over 90% of the engagement you receive on your tweet happens in the first 18 minutes so understanding the best time to post is crucial. Timing does matter now more than ever as more and more content is appearing online. You need to do your research, and find out the day and time your audience are most engaged with your content on each network to make sure you are receiving maximum exposure. There has been a very diverse conversation online around the length, and production of content. Over the last year, we have seen an increase in longer pieces of content, and a decrease in shorter pieces of content. I have personally adapted this strategy of writing one piece of content every two weeks on the Warren Knight website that is more thought out, and is a longer piece of content. 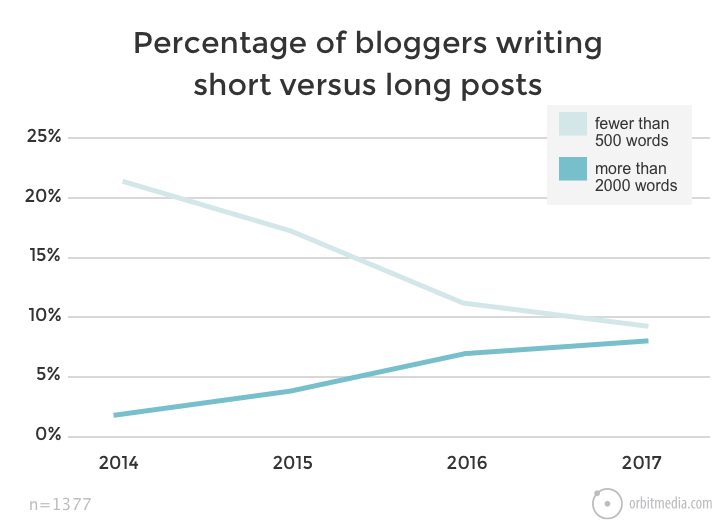 As you can see below, long-form content has gradually increased, as short content has decreased. Did you know that 92% of small businesses lose money every single month because they ignore marketing automation? Whilst being relevant and personal is still a key part of any kind of communication, it has to be said that automation is a great way to add value, increase engage and save time. For me this plays a massive part in reducing the sales cycle. In my opinion, marketing automation is going to be even more powerful next year, and it is something I have been working on, regarding email marketing, and PPC. A study run by Orbit media showed that content writers who use images got better engagement, and the same can be said regarding tweets. Stone Temple Consulting reviewed 4 million tweets, and this showed that tweets with images gained more retweets, and favourites. It’s a lot easier to share just text-based content but the web is populated with this. To be unique, and encourage engagement you have to make the effort and this can be done through creating great visuals. Did you know that you can upload a photo to Twitter and tag your followers in this photo so that they are notified by Twitter? This has been extremely powerful for me, especially when I ran a Social Media Giveaway earlier this year. I noticed that tweets with an image where I had tagged 10 businesses/individuals that I engage with on a regular basis received over 150% more engagement compared to a text-driven tweet. The final fact I want to share with you is around social listening. We know that it’s easier for a customer to share a negative review online than it is to share a positive one. 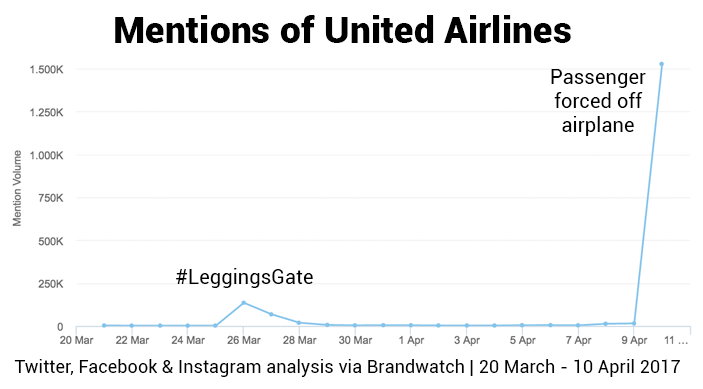 We all remember United Airlines PR fails this year after removing a passenger for wearing leggings, and another incident where a passenger was forcefully removed from an aircraft. The mentions below speak for themselves. Yes, this is a very extreme example, but always listening to what is being said about your business online is essential. Setup real-time alerts, and always be as aware of the negatives as you are of the positives. 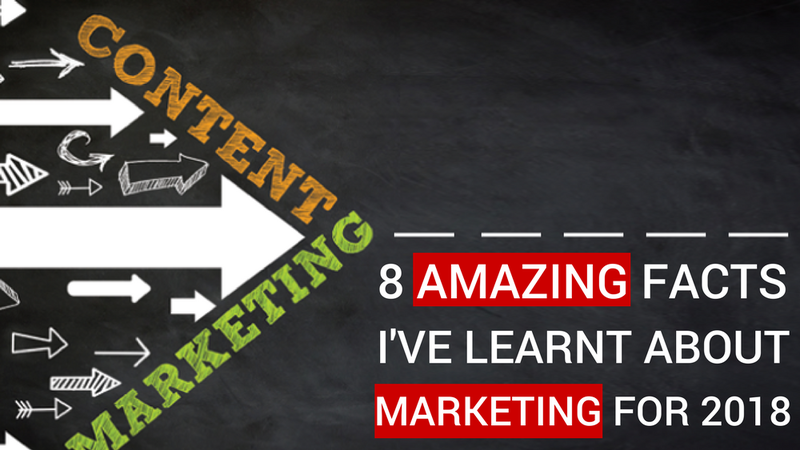 What have you learnt about Marketing, and do you agree with my 8 statements above?